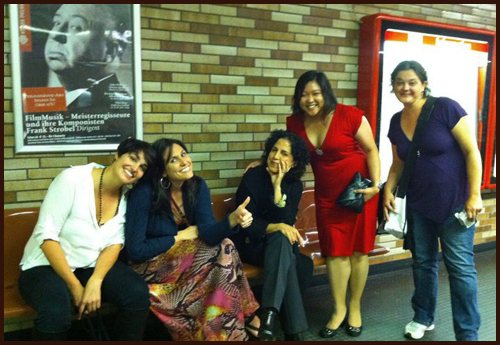 As we’ve been tweeting over the last few weeks, we were honoured to be part of One More Lesbian’s Theatre Nights in Cologne, Germany, last week. Part of the festivities of the Gay Games 2010, this showcase of web series from around the world put Fletcher in pretty great company alongside Seeking Simone, Cherry Bomb, Real Girls Guide To Everything Else, We Have To Stop Now and Emma Stahl. The red carpet was hosted by comedian Bridget McManus for AfterEllen.com‘s coverage of the event (right, teasing me about wearing red on the red carpet!). I had a great time meeting all the fans – old and new – so thank you so much for turning out to support us! There is something quite thrilling at staring up at Fletcher on a cinema screen 15ft high when you’ve been used to watching it on your laptop. Hearing the trumpets in surround sound at the start of our opening credits was enough to wake the dead and it took me a while to realise that I had stopped breathing because I was geeking out! Thanks again to Martina, Noah and Michelle for helping us provide the subtitles for our German audience. I was also happily reunited with the team from eurOut, including founder Sandra Showtime and Editor In Chief, Saskia Joreen, as well as many of their contributing writers from across Europe. 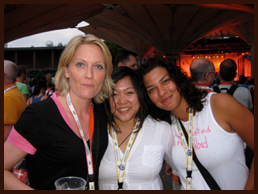 It was also great to meet people from other shows; in fact, I watched Emma Stahl sitting next to Emma Stahl herself, actress Meike Gottschalk (left here, with eurOut’s Saskia Joreen at the closing ceremony of the Gay Games 2010). I’m going to take away a lot of memories from this trip: dancing to Lady Gaga with four other floors of women at Bound Magazine‘s Triumph and Temptation party; doing an interview with Saskia from eurOut whilst we swam in my hotel pool; panic buying for the white party with a number of Gay Games atheletes that were also unaware of the closing night party’s dress code; watching mixed pairs ballroom dancing; debating our favourite web series in the WomenPlace tent, and being called prissy by the lovely Bridget McManus whilst sat on the pavement after midnight drinking after the closing ceremony. Thank you to One More Lesbian for hosting such a great event, to Daniela Zysk, Gay Games oganiser of the WomenPlace, for taking such good care of us, and to all of the amazing participants that we met who shared their stories, their experiences and laughter and made this trip such an amazing experience! « Sichern und laden – we’re going to the Gay Games! » How many people does it take to thank our volunteers?